The way it used to be. "For those of us who can remember the bad old days, the border is certainly not a phantom issue." The Brexit process for Britain to leave the EU has cast serious doubt on the harmonious functioning of the Irish border. This doubt is very much fuelled by the stated aim of the Brexit process to allow Britain to "take back control" of the movement of people and goods between the UK and the EU. This doubt is not the fault of anyone on the island of Ireland, despite what the pro Brexit English Conservative MP Jacob Rees Mogg may suggest. "If we leave without a deal", Rees Mogg commented, "the main culprit will be the obdurate Irish government’s threats about the phantom border issue". The Good Friday Agreement was an enormous political achievement and one that the world can be proud of. Signed in April 1998, it differs from the Brexit process in that its’ aim was to fix something that was actually broken. Since it came into force, it has allowed the island of Ireland to function relatively normally and the geographically nonsensical Irish border to become almost invisible. Anyone who lived through the troubles in Northern Ireland and experienced paramilitary violence, road closures and permanent checkpoints involving armed soldiers and policemen will perhaps be forgiven for not wanting to return to the bad old days. For those of us who can remember such things, the border is certainly not a phantom issue. Brexit: The process for the UK to leave the EU. The decision was made by the UK Government following a non-binding UK wide referendum in 2016. Article 50 of the Lisbon Treaty was triggered on 29th March 2017, which means that the UK is on course to legally leave the EU. 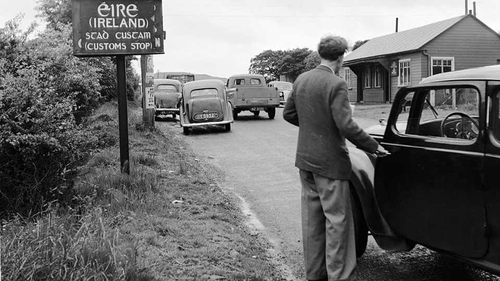 Hard border: Means that people and goods will be stopped and checked at all border crossings. At present there are more than 200 crossing points but many of these may be closed to prevent the Irish border becoming a backdoor between the UK and the EU if more restrictive rules are imposed. Backstop: Refers to the EU plan for Northern Ireland to continue to have the same rules as Ireland in relation to the free movement of goods and people, to facilitate a low-friction border until a trade agreement is put in place between the EU and a post Brexit UK. Single Market: This guarantees the free movement of goods, capital, services, and labour (the "four freedoms") within the EU. The UK wants to leave this, removing this guarantee for those wishing to travel or trade across the Irish border. The balance of trade now greatly favours the UK as Ireland has steadily reduced its exposure to the UK market. EU Customs Union: Conceived in 1957 and completed in 1968, it allows tariff free trade within the EU. Brexit would almost certainly see new tariffs imposed. 1. Free movement lanes at major border crossings for eligible people. 2. Use of Enhanced driver's licenses and Radio Frequency Identification (RFID) capabilities. 3. Use of Automatic Number Plate Recognition (ANPR) at manned and unmanned border crossings. 4. Requirement for people not eligible under CTA to present at a manned border crossing. 5. One check: at jurisdiction of entry. 6. Creation of a frequent travellers program for people not eligible under the CTA. 7. Legal basis for collaboration and data exchange between Ireland and Northern Ireland. 1. A bilateral EU-UK agreement regulating an advanced customs cooperation that avoids duplication and where UK and Irish customs can undertake inspections on behalf of each other. 2. Mutual recognition of Authorized Economic Operators (AEO). 3. A Customs-to-Customs technical agreement on exchange of risk data. 4. Pre-registration of operators and people (Commercial Travellers programme in combination with a Certified Taxable Person programme). 5. Identification system by the border. 6. A single window for standardized electronic information with one-stop-shop-elements. 7. A Unique Consignment Reference number (UCR). 8. A simplified customs declaration system (100% electronic) with re-use of export data for imports. 9. Mobile control and inspection units. 10. Technical surveillance of border using Closed Circuit Television and Automatic Number Plate Recognition (CCTV and ANPR). At the moment, official trade between Northern Ireland and Ireland amounts to about €2.5 billion per annum with 23,000 people commuting across the border for work each day. The trade figure is estimated to reduce by about 17 percent with the introduction of a hard border. A low friction electronic border would almost certainly reduce that loss. But the political reaction to a hard border in Ireland is uncertain. While the West Lothian question and the rise of English nationalism may be driving Brexit, Irish nationalism "hasn’t gone away you know" and the Irish government is acutely aware of this. All solutions to minimise the risk of a return to the bad old days of the troubles should be explored and that should include research into the potential of an innovative electronic backstop for the Irish border.